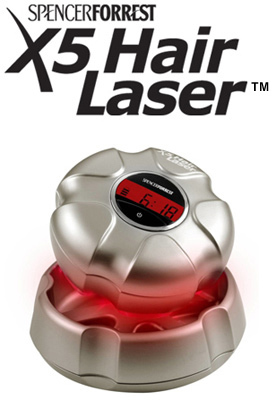 The Spencer Forrest X5 Hair Laser provides effective Laser Light Therapy with a comfortable and easy to use design. With just three 10-15 minute sessions per week, you will see results within a few weeks. Guaranteed. Spencer Forrest, Inc. is the over 25 year leader in cosmetic treatments for hair loss. Spencer Forrest products are recommended by doctors worldwide, and have given confidence to millions of men and women. It's alla over the news media : Low Level Laser light has been shown as the most effective new treatment available for thinning hair. It improves the appearance and condition of fine or thinning hair with only three 10-15 minute treatments per week. Worldwide attention is focused on the remarkable results men and women are achieving in as little as a few months. And now you can enjoy these results at home with the most advanced laser hair theraphy device ever developed. Mark Kress is the founder and president of Spencer Forrest Inc., the company that almost single-handedly created the category of cosmetic solutions for thinning-hair. Like so many hairloss businesses, Spencer Forrest was the response of one man to his own predicament. In this interview, Mark takes us back 26 years to those early days and describes how Couvre led to Toppik and, now to laser light therapy.